One day more. Cue Jean Valjean. Tomorrow is my release date. I'm strangely zen about it. I'm going to call this a "soft release," because I have no idea what's going to actually be available for purchase tomorrow. Let me outline the state of things and then I'll explain why I'm not upset about it. The Kindle version is available for preorder. The paperback isn't yet. The Audible version is undergoing the approval process, but we got them the audio files kinda late, so I can't blame them. The ARC (Advanced Readers' Copy) of the book might or might not be finalized. The last note I heard on the matter was that I'd hear back Friday, but I didn't. The categories on the book in Amazon look a little strange. I've asked the publisher if they are intentional (It's not in humor, for instance), but I haven't heard back. Most of these questions I posed to them Friday morning, which was the last working day before release, since the book releases on a holiday. My base assumption is that they were too busy Friday to respond to me. That's okay. So today, while paused in the recording of the Hold 322 podcast, one or more of my co-podcasters may have come to my defense, angry that at this moment, it looks like the paperback might not be available tomorrow. In the long run, who really cares? Seriously. What does one day mean over the other? CQ actually gave me the option of moving the release date when I realized it was on Memorial Day. I thought about what that might entail and went through all the possible implications. I decided not to bother moving it. This is my first released novel. Not many people are waiting for it. While the people who are waiting for it specifically wait for the paperback version, I don't have a large fan base who will be enraged if it's a day late. Let's do the math. I had about 5,000 listeners to the podcast audiobook. The conversion rate to sales is probably about 1-5 percent. Since the book was free and many of the listeners picked it up when Howard Tayler asked them to break my server, 1 percent is far more likely than five. So that translates to about 50 people who were waiting for a physical copy to go with their digital audio one. But that was eight years ago, and the while the interest was high. At one point during the podcast, we missed a month. During the month I went from more than 5000 listeners to almost none. I had to completely rebuild my listener base. And that was just a month. Eight years? Most of those 50 don't even remember they wanted to buy the book in the first place. There are about five left. I know because they message me regularly about various things. So Monday is an arbitrary date. I'm not even going to start my marketing push that day, because I don't want to waste my primary shares on a day where most people are doing family barbeques. I'll put out my general announcement tomorrow, and I'll probably get five to ten sales out of that, but I won't be concerned if it's zero. Tomorrow isn't the day. Tuesday, if everything is ready, I put out my big post. This is the one where I tag all the people quoted in the book and hope for a huge number of shares and retweets. The next day I'm on the Scalzi's Big Idea blog on Whatever. Monday and Tuesday, I'll probably be mentioned on the Left Show and on Hold 322, and as podcasts, the listeners will hear those throughout the week. A week from Saturday, I have my book release party. But those sales aren't added to any list, so they are just for me. I'm happy. I'm excited. I'm ready to buckle down and get to work. But I've been doing this too long to have expectations of overwhelming results. This is just the next thing that happens. After that there will be podcast tours and marketing pushes and maybe ad buys. The real work starts this week. P.S. 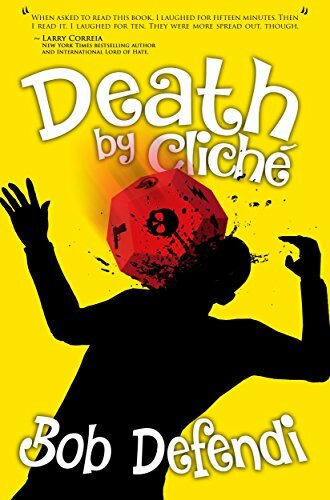 I also turned in Death by Cliche 2 at about 4 am this morning. So there's that.